Pembrey Country Park Country ParkPeople visit Pembrey Country Park for many different reasons. Some to enjoy the freedom to wander around 500acres of glorious parkland, some to take advantage of one of the best beaches in the UK, others to use the host of excellent family attractions found in the Park. Set against the spectacular backdrop of the Gower Peninsula and overlooking the coastal scenery of Carmarthen Bay, the Park had been transformed into one of Wales’s top visitor attractions providing a unique blend of coast and countryside. 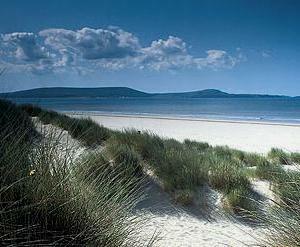 People visit Pembrey Country Park for many different reasons. Some to enjoy the freedom to wander around 500acres of glorious parkland, some to take advantage of one of the best beaches in the UK, others to use the host of excellent family attractions found in the Park. winning golden sandy beach, dry ski slope, toboggan ride, crazy golf, pitch and putt, train rides, adventure play area, equestrian centre and a variety of nature trails, there is something to offer the whole family! Catering available at the Restaurant, Beach Kiosk and Ski Lodge Cafe. The Park is open daily from dawn to dusk. The Park main gates are locked between 22.00 and 08.00 from 1st October to 31st March each year. All other facilities open subject to seasonal variance - see individual facilities for details. 1 October to 31 March - Before 09:00 £2.00, 09:00 - 16:30 £2.00, After 16:30 £2.00. 1 April to 30 September Before 09:00 £2.00, 09:00 - 16:30 £5.00, After 16:30 £2.00. By Car: The Country Park can be found just off the A484 Llanelli to Carmarthen coast road just outside Burry Port. The Park is approximately a half hour drive from Carmarthen and a similar distance from Junction 48 M4. Follow the Brown directional signs. The bus stop for the Park is located 2km from the attraction and is served by First Cymru service X12 . For information please contact the All Wales Bus Information Service on 0870 6082608. Cyclists and pedestrians can use the Millenium Coastal Path/Celtic Trail to access the Park from Llanelli and Burry Port.